Far Stronger than Block! a poured wall is solid concrete. You get about 40% more concrete in the walls! What's more, we give you monolithic construction...there are no joints. The entire basement is a solid, single unit! Lab tests prove this construction is many times stronger to withstand the side and down pressures caused by earth, water, wind and building loads. Drier than Block! You get a far denser wall to resist water penetration because a poured wall weighs about 50 lbs. more per cubic foot! Virtually Maintenance Free! 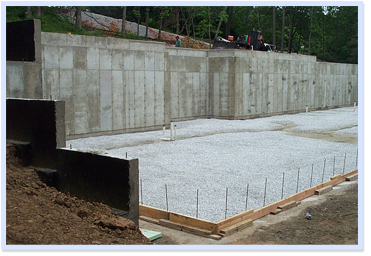 Solid, jointless walls have unequalled durability and permanence thru the years. Competitively Priced! Our modern and efficient construction techniques favorably compete with block and mortar methods. You get a lot more for your dollar.